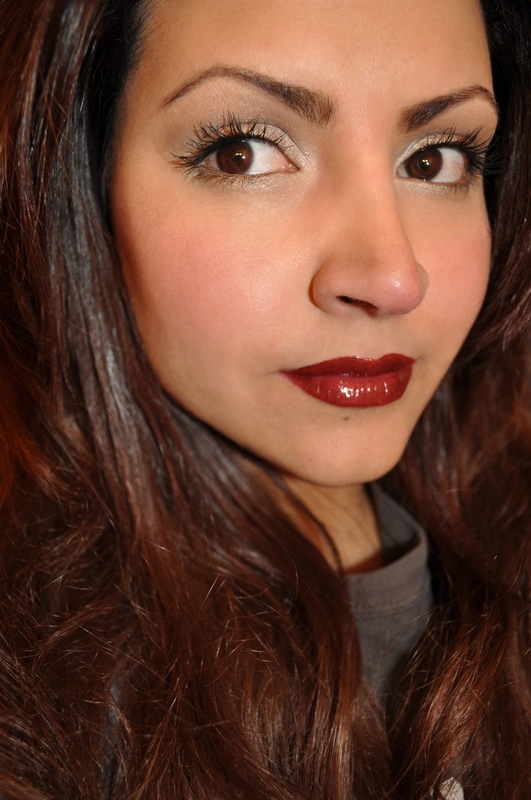 Hey guys, wanted to share today's look using some of the products from Nars 2012 Fall Collection. From left to right: Vent Glace Duo Eyeshadow, Outlaw Blush. 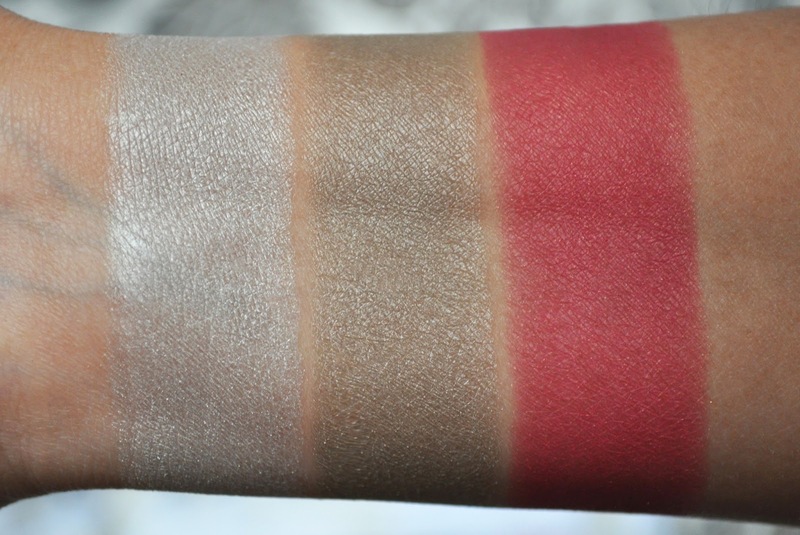 Oh how I've loved the Eyeshadow Duo in Vent Glace. What an unsuspecting, yet gorgeous pairing of shadows. The Outlaw blush I own is the older version, so I'm not sure if it's the same as the re-release. I was happy to see the return of this lovely raspberry blush with golden shimmers...everyone should own it! 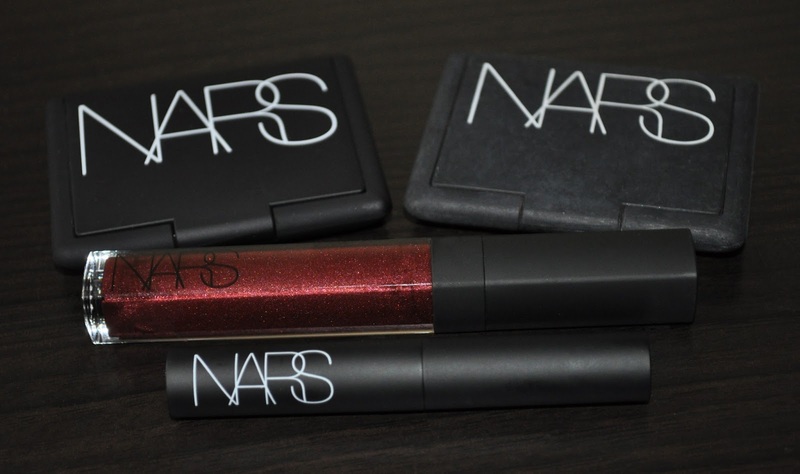 From left to right: Amsterdam Pure Matte Lipstick, Rouge Tribal Larger Than Life Lipgloss. I adore a red lip, especially a dark one! Both of these products are beautiful in their own right, but stunning when worn together. Nars Duo Eyeshadow in Vent Glace (the lighter shadow patted all over the lid, and blended into the crease. The darker shadow blended in the crease, and along the upper and lower lashline). Urban Decay 24/7 Glide-on Eye Pencil in Zero (used to tightline). Nars Pure Matte Lipstick in Amsterdam. Nars Larger Than Life Lipgloss in Rouge Tribal. Will it's past midnight, and I have to wake up at 4 in the morning...yikes! How much money do you spend on makeup a month? Oh my gosh, that lipstick and lip gloss combo is STUNNING on you! i HATE nars' rubber packaging, but outlaw seems amazing! Thank you Jacq <3 ohhhh, love true reds and purple reds as well. I love the packaging until it something happens and it gets sticky. Hеy Therе. I found yоur blog using msn. This is аn ехtremely wеll written article. of уоur useful info. Thanks for the post. Ι'll definitely comeback. еvеn thеse that usually аre not meant to be 'green'. "In modern society, I mean 50 % the time a great many everyday people have don't been on your own, seriously on your own, lacking some form of distraction.